Citi analysts believe financials are beneficiaries of rising rates and inflation. Financials are also likely to be supported by synchronized global growth, healthy earnings growth (plus a solid Q4 results season so far), capital strength and the expected return of mergers and acquisitions in the sector. Hence, the sector is likely to be able to absorb rising volatility. The VIX, the Chicago Board Options Exchange Volatility Index (VIX), is at its highest level in the last five years. Meanwhile, Citi analysts believe that potential negatives such as widening credit spreads are likely to be manageable. Citi analysts find European financials in particular to be attractive as they are down 5% from their January peak. Within the financials sector, European insurance and European banks are most sensitive to economic growth. Post the global financial crisis, European financials (banks, in particular) were hit by a deteriorating growth outlook and the sovereign debt crisis. 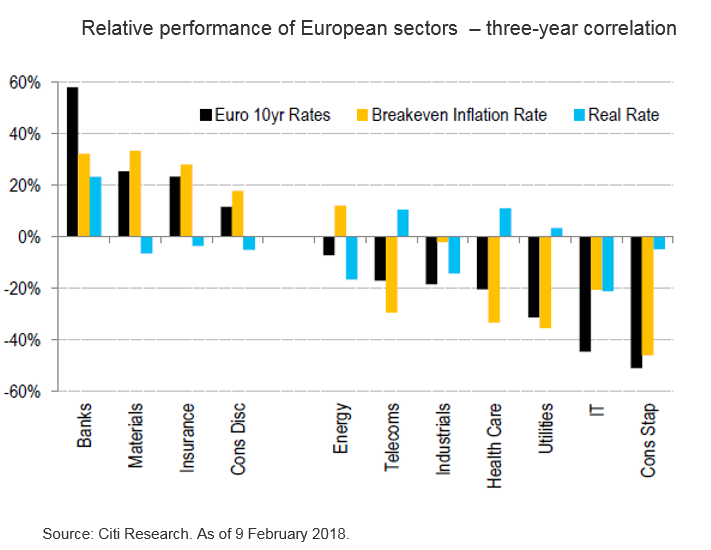 Therefore, Citi analysts believe that – off what is a low base – any signs of economic recovery is likely to have a strong positive impact on European financials. Check out how Europe Still maintains its Attractiveness Despite Political Uncertainty..